Alexis Kibler-Russitano, a 19-year-old mother of a two-year-old and 6-month-old, currently resides in Williamsport, Pennsylvania. She was referred to the STEP, Inc. Youth Enrichment for Success (YES) Program by the Education Leading to Employment and Career Training (ELECT) Program located at the high school through River Valley Health and Dental Center. Alexis was in need of supportive services as she struggled to complete her high school diploma while meeting her newborn’s needs as a teenage mother. Alexis chose to engage with the YES Program to work toward future goals of completing high school, obtaining employment, furthering her education, creating a résumé, building employment skills, and providing for her family. In the beginning, Alexis was struggling with the adjustments of being a mother and discussed her declining academic performance along with her doubts concerning her ability to graduate on time. Alexis needed community supports to help her gain the confidence to continue pursuing her goals, and to encourage her development of the parental skills necessary to care for her newborn. Alexis initially participated in weekly appointments with the YES Program Caseworker as she completed assessments to work toward gaining self-sufficiency. With only a few months remaining of high school, and shortly after enrolling in the YES Program, a tragic fire destroyed the family’s house and belongings. During this time, the American Red Cross, The Salvation Army, Family Promise, and Favors Forward Foundation were recommended services. Alexis’s family received numerous donations from the community, and the American Red Cross provided temporary shelter at a hotel. After several weeks of searching for safe and affordable housing, the family moved into a new apartment and began rebuilding. Once the family’s immediate needs had been stabilized, Alexis continued to work toward her high school diploma. She successfully graduated in July 2017 from Williamsport Area High School. Unsure of her career path, she explored options and ultimately decided to pursue a career in the field of nursing. 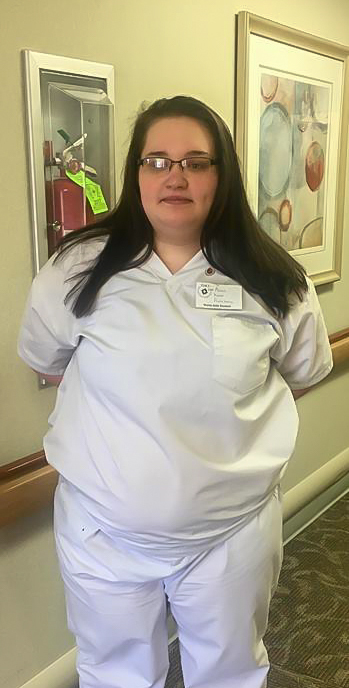 She received a paid training through Williamsport Homes and obtained her Certified Nursing Assistant (CNA) Certificate. The YES Program provided her with a watch, scrubs, and non-slip shoes. STEP, Inc. assisted Alexis with case management services and monetary, educational, and employment incentives. Alexis has made significant progress and gained the confidence to work toward completing her goals. The ELECT Program allowed her to interact with case managers and other teen parents as she developed parenting skills. She has matured and has shown self sufficiency, an enhanced level of parenting skills, and the determination to work toward maintaining a stable future. Alexis continues to maintain employment and stable housing. She has successfully completed each of the requirements for the YES Program.